The objective of this study is to develop a comprehensive model to explain why organizations adopt Web-based Supply Chain Management (SCM) applications from an institutional perspective. Questionnaire survey was used to collect data from manufacturing firms in Jordan. Structural Equation Modeling (SEM), using EQS was used to analyze the data. The results indicated that the environmental coercive and mimetic pressures and organizational characteristics have a positive effect on the top management’s perception and support of Web-based SCM adoption and usage. Furthermore, the study revealed that the Web-based SCM applications represent the pool that reflects the degree of response to institutional pressures. 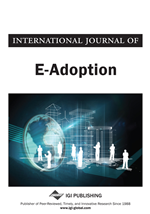 This study was the first to empirically explain why organizations adopt Web-based SCM from an institutional perspective, adding new contribution to the developing literature on Web-based SCM. Understanding the external pressures and the effect of organizational factors will provide the practitioners with better knowledge on how to manage the adoption of Web-based SCM applications. The Supply Chain Management (SCM) excellence has become one of the major strategies to achieve a sustainable competitive edge or generate competitive advantage. Successful SCM requires the awareness that the firm is simply one member in the long chain. All supply chain members require a high level of information sharing, collaboration and tighter integration with other members. The competitive challenges facing today's organizations, coupled with advances in Web applications, are forcing companies to make massive investments in Web-based based systems. Collaborative Web- based information systems have become a major trend in today’s business environment, reaching into almost every aspect of organizational and inter-organizational work. Contingency theory suggests that organizations whose internal features best fit the demands of their environment will achieve the best adaptation (Scott, 2005, p. 96). Consistent with the Institutional Theory, SCM literature views the supply chain as a set of organizations that are embedded in institutional networks (Teo et al., 2003; Ranganathan et al., 2011; Ngai et al., 2004). According to the Institutional Theory, organizations are subject to pressures to be isomorphic with their institutional environment. Prior research (e.g., Bouchbout & Alimazighi, 2008; Liang et al., 2007; Mignerat & Rivard, 2009; Ranganathan et al., 2004) has indicated that the organizations in supply chain often adopt IT solutions due to the institutional pressures exerted by the members. Thus, it can be considered as predictors of adoption and usage levels of IT. Top management represents the primary human agency that provides the necessary resources and power for success of adopting any new innovation based on their perceptions and beliefs. A number of researchers (e.g., Wang et al., 2004; Delmas & Toffel, 2004; Liang et al., 2007; Bouchbout & Alimazighi, 2008; Teo et al., 2003; Tarofder et al., 2010) argued that the decisions related to how firms perceive institutional pressures and how they decide to respond can best be explained by consideration of the decision makers’ bounded rationality. Managers’ bounded rationality constitutes a mental cognitive structure and beliefs that transforms objective pressures into perceived pressures and translates external influences into managerial actions. Furthermore, much of literature concluded that the institutional environment does not constitute the only determiner of collaborative IT adoption. The prior research (e.g., Delmas & Toffel, 2004; Teo et al., 2003; Mignerat & Rivard, 2009; Bhakoo & Sohal, 2008; Wang et al., 2004; Liang et al., 2007) has highlighted different categories of organizational critical factors that mediate the impact of institutional pressures on the top management decision of IT solutions adoption.